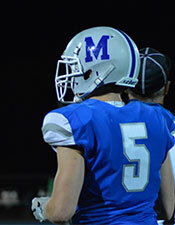 By the end of his junior year, Joe Strecker had just finished fourth in the boys 4x100 meter relay at the WIAA State Track and Field Championships, and was a varsity member of both Manson HS football and basketball teams. 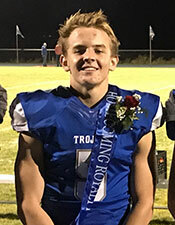 Strecker, who is now a senior on the league-leading Trojan football team, would have never predicted these accomplishments when he entered high school three years ago. Even though Strecker came into high school not considering himself an athlete, he enjoyed playing so much that he decided to make athletics a part of his high school experience in a big way. Strecker is now the starting running back, football team captain, and basketball captain for the Trojans. His dedication to sports has not diminished, as he is involved in other leadership activities at his school. He serves as the ASB vice president, FBLA treasurer, and Honors Society member. His determination and perseverance transformed his abilities one year at a time. Coach Johanson is new this year as the Manson football head coach, but he has witnessed this transformation since joining the staff for during spring football. He speaks highly of Strecker and his natural leadership skills, as well as his adaptability, positive mindset and determination. So far this season, Manson football is 6-1, and continuing to rise each week. 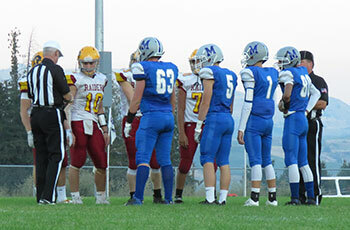 The season got off to an exciting start, when Manson beat Oroville for the first time in 15 years. Coach Johanson attributes much of this success to the buy-in he has received from Strecker and the entire team, since he arrived at Manson. The Manson football team has contributed to more than just the win column this season. Strecker and his teammates have made an impact in the community by setting up for Kiwanis events, and providing manual labor services around town, including setting up the downtown Manson light posts. On his own, Strecker mentors a couple elementary school kids and referees youth football. For Strecker, balancing everything has never been an issue, and it shows on and off the field. Strecker’s current GPA is 3.7, and he has racked up around 55 college-level credits through courses offered at Manson. 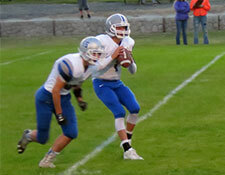 He wants to attend Gonzaga University next year, but he is also considering playing football for a smaller school. Although Strecker has only been a varsity athlete for a couple years, his newfound joy has made him aware of the importance of participating in sports and extra-curricular activities. Strecker’s relationship with his first-year coach has been brief, but their values of teamwork are right in step with one another. Because of this, Johanson is confident that Strecker will find success after high school, regardless of what he decides to pursue.